PCWin Note: Banner System for X-Cart Mod - X-Cart Mod 2.0 download version indexed from servers all over the world. There are inherent dangers in the use of any software available for download on the Internet. PCWin free download center makes no representations as to the content of Banner System for X-Cart Mod - X-Cart Mod version/build 2.0 is accurate, complete, virus free or do not infringe the rights of any third party. PCWin has not developed this software Banner System for X-Cart Mod - X-Cart Mod and in no way responsible for the use of the software and any damage done to your systems. You are solely responsible for adequate protection and backup of the data and equipment used in connection with using software Banner System for X-Cart Mod - X-Cart Mod. ICQLite PictureChanger - With ICQLite PictureChanger you can remove the advertising banners from your ICQ Lite and replace the banner above your contactlist with an own picture. Banner Design Studio - Banner creator allows you to create professional banners using pre-designed banner templates. Customize these templates with variety of symbols, fonts, animation and images for creating stunning banner within a few minute . No extra skills are needed to create banners. Use transition effect for animation and save your banner in any format. 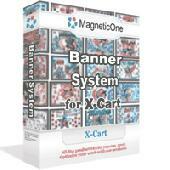 Order banner creator now and get 50% OFF. Amara Intro and Banner Builder - Amara Intro and Banner Builder is the ultimate Flash text effect tool to help the web designer create and design flash animations. Advanced SEO for x-Cart - Advanced SEO for x-Cart is powerful replacement for standard x-Cart static catalog with unique features for best Search Engine Optimization of your site. Music Player for X-Cart - X-Cart Mod - Music Player for X-Cart - X-Cart Mod - is very easy in use music player, which could be placed on every page of your store to create strong impresseion about your products. XML Sitemap for X-Cart - Generates XML Sitemap, REQUIRED for search engine optimization for Google, MSN, Yahoo - all at once! 4 Step very easy installation, start using in 5 minutes! Completely dynamic - no additional support required. Boardawy - Free open source code in Perl forum software and bulletin board system multi lingual multi theme SQL driven highly customisable, the ideal community solution for any web site. Bandwidth Monitor - Bandwidth Monitor tracks all network connections traffic and displays real-time graphical and numerical data transfer rates. It can display multiple connections rates at the same time. Bandwidth Monitor works with all types of network connections. BatchSync FTP - BatchSync is a reliable tool for automating remote backups, file synchronization, moving and mirroring over FTP. It is designed to be run scheduled at the server, with extensive logging options and email notifications to help with remote monitoring.